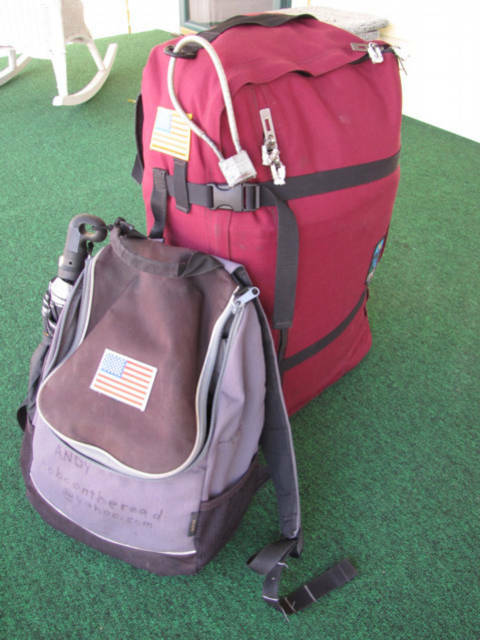 Luggage, a few rules of thumbs, and some concepts to learn for travel. Weight allowed by the airline of your choice. - I want to truly warn travelers, it is possible to follow the airline rules when you buy a round-trip ticket, when you travel the world, it is complicated. This is the bags I am carrying as of 2010-2011, the red bag was sold as a carry-on size, the reality is this, it does not fit in any of the testing racks. In my opinion, 90 percent of the bags sold as "Carry-On" will not fit, they are too big for the real test. As a rule of thumb, you can normally carry 22 Kilos, after that you must take great care and check with the airlines before going to the airport. Carry-on bags now are about the size of a large computer bag, they are not allow you to slip by with large bags. Luggage is any number of bags, cases and containers which hold a traveller's articles during transit. The modern traveller can be expected to have packages containing clothing, toiletries, small possessions, trip necessities, and on the return-trip, souvenirs. For some, luggage and the style thereof is representative of the owner's wealth. Baggage can be synonymous with "luggage", or can refer to the train of people and goods, both military and of a personal nature, which commonly followed pre-modern armies on campaign. The baggage was considered a strategic resource and guarded by a rear guard. Its loss was considered to weaken and demoralize an army, leading to rearguard attacks such as that at the Battle of Agincourt.